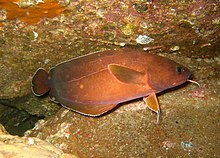 For other fishes named "rockcod", see rockcod. The rock cod (Lotella rhacina) is a temperate fish found off the coasts of southeastern Australia, Tasmania, the Great Australian Bight and northwards up the southwestern Australia coasts. They are also found around the coasts of New Zealand and California. They belong to the family Moridae and are not related to the true cods (genus Gadus). They are also known as beardie in Australia. Rock cod are yellow-grey to red-brown with white fin margins. They have chin barbels. They may grow up to 50 cm in length. They are found in caves in bays and coastal reefs. They are frequently found inshore and inhabit shallow waters in the continental shelf with typical depth of 10 to 90 m.
Many other fish are sometimes referred to as rock cod, but most are unrelated to the cod family, and are better known as groupers. "Lotella rhacina". Integrated Taxonomic Information System. Retrieved 19 March 2006. Froese, Rainer and Pauly, Daniel, eds. (2005). "Lotella rhacina" in FishBase. November 2005 version. This page was last edited on 29 November 2018, at 14:37 (UTC).